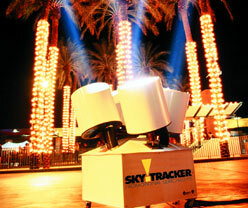 SkyTracker searchlights are the most popular search light available for outdoor promotions. If you're looking to bring a great deal of attention to an event, grand opening, concert, sporting event or big sales event, SkyTracker is the light you're looking for. Our SkyTracker Searchlights are mobile and operate on a self contained generator. We also rent SkyCannon Hollywood Style spotlights. The perfect spot light for proms, weddings and partiers-- SkyCannons can be used nearly anywhere and plug conveniently into any standard electrical outlet. Renting a searchlight or spotlight is easy and affordable. We can deliver them to your location so you can focus more on your event without losing valuable time. We offer: 4 beam & 1 beam SkyTrackers, single beam Sky Cannon and Ad Lights. We have a light for any outdoor event! Displays an animated message to draw more attention. Available in one color or full color! Many balloons and inflatable characters to choose from! Serving: Jacksonville, Miami, Tampa, St. Petersburg, Clearwater, Largo, Hialeah, Orlando, Ft. Myers, Fort Lauderdale, Tallahassee, Hollywood, Sarasota, Pembroke Pines, Gainesville, Kissimmee, Lakeland, Brandon, Valrico, Plant City, Port St. Lucie, Port Richey, New Port Richey, South Florida, Cape Coral, FL. SkyTracker FL Offers Affordable Spotlight Rental to Clients Across the Entire State of Florida, Alabama, Georgia and South Carolina. Rent Moving 4-Head Search Lights and 1-Head Search Lights & Spot Light Rental in Florida. L.E.D. 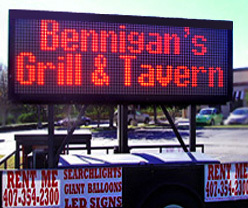 Sign Rental. Searchlight Rental Serving all of Florida, NC, AL & GA. L.E.D. Search Lights are a Very Effective Way of Driving More Traffic to Your Big Sale, Grand Opening, Car Dealership Car Sale, Tire Sale, Special Event or Concert! 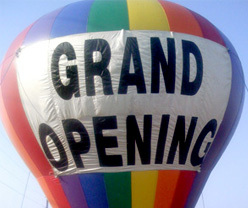 Sign Rentals are Available for Rent in the Following Florida Cities: Tampa, St. Petersburg, Melbourne,	Palm Bay, Port St. Lucie, Orlando,	Gainesville & Lakeland. SkyTracker Parts & Bulbs. site map | "Searchlights Florida"